It's a Project Linus quilt that is going to allow me to "play" with my Quilt Magician motifs. I've enjoy my pantographs but am going to play with resizing and fitting pieces into specific spots. This construction theme will make a fun finish for some little guy through the Project Linus organization and yet, allow me the opportunity to play as I expand my expertise in using my Quilt Magician. My goal is to quilt a row each day after work. I'd love to quilt for you! May through July I'm offering free returning shipping on all quilts and only charge .018 cents per square inch. I specialize in edge to edge/pantograph designs with an extensive collection to choose from. 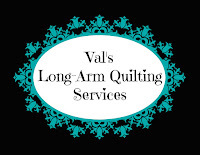 Contact me for your Summer quilting needs. I'd love to quilt for you. It's fun to hear from so many of you that have already begun collecting. What's Quilt Magician, Val? Is your long arm machine computerized, and if so, what kind of program are you using with it? Those hats are super cute. Yes...my long arm is computerized and quilt magician is the computer. You have made those fit so well in the blocks. A little boy will love this. That's a really great way to practice and make someone special happy at the same time Val! I wondered about the "Quilt Magician" part (read your answer above) and the craziness of all the stops and starts. Been there, done that. Can't say I like it much. Great design. Fun quilting motifs. Sure to please some young man. Very fun motifs. A donation quilt is a great way to practice.